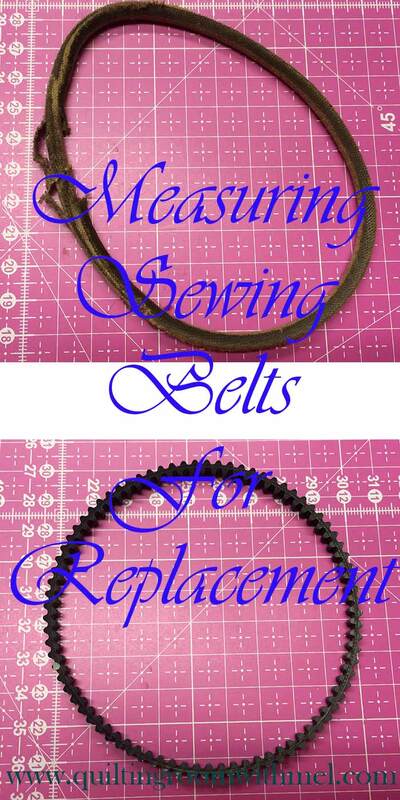 Hello everyone today I would like to share some of the different ways we measure sewing machine belts when we need to replace a broken, missing or worn out belt on our Vintage sewing machines. I will try to explain the measuring system and why sometimes the part numbers are a valid piece of information and other times useless. 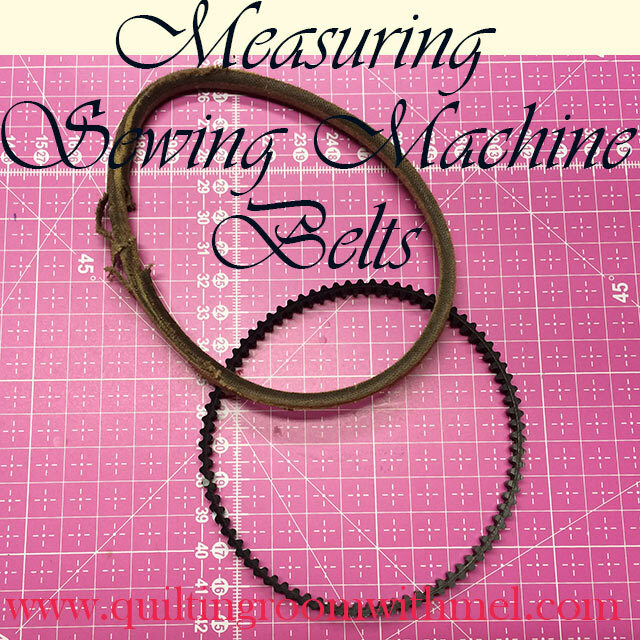 Measuring your machine is the most accurate way in ensure proper belt length especially if you are not the original owner of said machine or possibly even the current owner. I do a lot of sewing machines for people who have inherited old family heirloom machines that have not been out of the closet for decades and now they want to learn to use them. Three things are almost always guaranteed under these circumstances, #1) they are stuck from sitting and have to be freed up, #2) the belt has hard spots in it where it sat for years and didn’t rotate so now it shakes itself across the floor when it is sewing, And finally #3) Watching in silence as a dream becomes a reality and a favored ancestor is remembered is priceless. OK, back on topic. When you are going to measure your machine for a new belt you have to start with the adjustable motor mount in the center of the slot so you can adjust either direction when you are installing a new belt. There are two major ways to gain a properly fitted belt. One is to wrap a quarter inch wide cord around the belt path until the open end overlaps the excess cord. While applying enough tension on the cord to keep it straight across the distance between the two pulleys top and bottom, make a mark on the excess cord even with the open end with a pencil or pen. Unwrap the cord from the pulleys and lay out straight on a hard surface keeping it straight but not stretched, measure from the mark to the open end of the cord using an accurate tape measure or quilters ruler. Subtract 1/8 inch from the measurement and that gives you the length of belt needed to fit the distance you just measured. I always do this at least twice just to double check myself before ordering. And since belts are measured in 1/8 in increments and you have started in the middle of the adjustment, you can use a belt 1/8 in longer or shorter than your measurement with no problems. A long piece of paper cut into a 1/4" strip can be substituted in place of the cord but it must be kept flat across the groove as it is wrapped around the pulleys. It works it’s a little more tedious but it is just as functionally accurate. If the machine currently has a belt that fits but it is needs replaced it can be measured by wrapping the length of the belt with a cloth tape measure or a very thin retractable tape measure. As long as the tape measure can remain in contact with the belting on the back side of the belt and not override the grooves of the pulleys it will not be necessary to remove the belt from the machine. When the belt rides below the top edges of the pulley it becomes necessary to remove the belt from the machine. The upside about the belt being off the machine is it becomes incredibly easy to measure. My preferred method to measure a belt off of the machine is to simply mark the edge of the belt where it rides on the side of the pulley. Then I use a couple of pieces of notebook paper taped together end to end to create a continuous sheet of paper. I place a pencil mark on the paper near one end. Then I line up the mark on the belt with the mark on the paper. Keeping positive contact on the paper I roll the belt along the length of the paper until the mark on the belt is once again flat down on the paper. I mark the paper again with a pencil. Remove the belt and measure the distance between the two marks on the paper. Viola, it is the length of the belt. If the belt is to be sacrificed then it is entirely ethical to cut the belt and measure it directly with a tape measure, However, if it already separated or broken, and it is diagonally across the belt always measure the same side of the belt when you measure. If you measure from (point) to (point) on a diagonal break or cut your measurement will be off by the length of the diagonal cut, it will be too long. These are the methods that I have found to be the most effective and easiest for me. There are other methods available but I am a firm believer that simpler is better as long as it meets the goal. But for the mathematicians in the crowd, I will offer one more method I learned long ago when I was a rookie HVAC tech. Start by measuring the diameter of the two pulleys, add the two together. Multiply this by 1.6 ( ½ pi).Measure the center to center distance between the two pulleys and multiply that by 2. Add the sum of the center to center distance to the sum of the two pulleys x1.6 together and you will have a very close approximation of the length needed. I hope you find these to be useful as you maintain your machines, if not then perhaps entertaining and good for a laugh. Until next time enjoy your machines and remember, A seam ripper stays sharp longer when you never use it.